Are men better than women at writing science fiction and fantasy books? The major awards in the field certainly seem to think so. And in case you weren’t aware of how widespread the problem is, a groundbreaking new research project has generated some utterly staggering charts. The folks over at Ladybusiness spent over 100 hours collecting data on the main awards in science fiction and fantasy—they surveyed 19 different awards, and a staggering 751 winners for book categories. (These are just for novels and book-length works, not short fiction.) And as you can see above, the most prestigious awards in the field tend to be awarded to men between 60 percent and 70 percent of the time—with only things like the Goodreads Choice Awards and the YA-focused Andre Norton Award going to a majority of women authors. 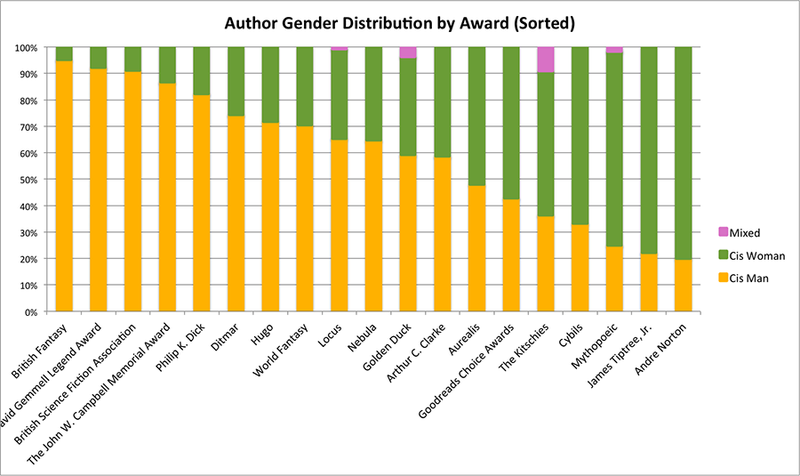 Bear in mind, the above chart covers the life of each award—so, for example, the Hugo Awards number goes back to 1953 and includes a lot of data from the era when women were much less well represented in science fiction publishing—although there were some fantastic authors, like C.L. Moore and Leigh Brackett, among many others. There are 100 charts over at Ladybusiness, and they drill down into some intense detail about just who’s being recognized by these awards. Among other things, 10 percent of cisgender men write books with cisgender female protagonists, but about 20 percent of cis women write books with cis male protagonists. Check out the rest of the charts over at Ladybusiness.